No matter how long someone has been climbing hills, there are always going to be gaps in the CV. Large-scale omissions covering unvisited areas are commonplace – there are, for example, plenty of people whose interest in hills barely extends beyond the Munros and who thus have no reason to visit the Borders or Galloway, the rugged western wedge of Ardgour, Sunart, Moidart etc, the Northern Isles or most of the Hebrides. A rather extreme example of this sort of selective approach came with a serial Wainwright-bagger to whom I was introduced at a funeral. He’d stacked up a ridiculously large number of rounds of the 214 Lake District fells, so I asked if he’d also done much in Scotland. “Oh no,” he said. “I went there once, but didn’t much like it.” Of course he could have been pulling my leg, but I think he was being serious. By contrast, those eclecticists who work their way round the massive UK-wide lists – Marilyns, HuMPs, etc – don’t have large-scale gaps but do tend to visit hills just once, rather than accumulating a stockpile of getting-to-know-you explorations from a variety of directions. Such people give the appearance of knowing their way around every hill area in the country, when in fact they often tackle things by the shortest route rather than rootling around in the quieter corners. Similarly, despite having done a reasonable amount over east, I’ve never been to Loch Einich. Much of my first-love Cairngorms wandering was from the Linn of Dee / Invercauld side (I was based in Aberdeen at the time) and the Einich basin isn’t very accessible from there, but in due course I started staying with friends in Kingussie, from where there was much less excuse. To this day I’ve still not been any further up the standard route to the loch than the Achnagoichan path-crossroads south of Whitewell. For a long time, however, my most notable omission came in the Lake District, to which I’ve been going regularly since 1983 (with multiple visits each year since the mid-1990s), but where I’d never set foot on the Corridor Route. This is the path linking Sty Head with the Lingmell col on the north side of Scafell Pike, a clever and precise route that sneaks through rough terrain and finds ways across the big vegetated gullies on the western flank of Great End. A glance at a map tends to make the Corridor Route look relatively level, but it actually climbs more than 200m from the Sty Head end – although the ascent comes gradually and the impressive surroundings make it one of those routes where any uphill effort feels almost incidental. I’m not sure how I’d failed to go here in upwards of 200 days spent on the Lakeland fells, but once I realised this a couple of years ago it started to feel like an itch needing scratched. Fortunately there was soon a good excuse, as by August last year I was down to just three Wainwrights to climb, two of which were Lingmell and Great End. A plan was duly concocted with my from-those-parts pal Gordon Ingall (a man with more than 11,000 Wainwrights and plenty of Corridor Route visits in his bag – and, it should be said, lots of Scottish outings): we would go in from Langdale and make a long day of it. This we did, in good late-summer weather, and it proved to be a fine outing if somewhat different from planned, as Gordon was feeling ill by Lingmell and we had to concoct a way back omitting the intended Scafell Pike but with the compensation of encountering a stoat in a short-cut gully near Round How. That slow, sneaky return to Langdale is another story however, and the real reason for mentioning the Corridor Route is that it was only on doing some reading prior to the visit that I realised there was a “bad step” to be tackled. Until then, insofar as I’d thought about it at all, I’d assumed it to be an entirely easy-for-walkers’ path. The presence of a potentially awkward section on an otherwise straightforward day out made me a little anxious. The hillgoing world divides into (a) those eager to tackle such obstacles and keen for them to be sufficiently tricky to provide a test, and (b) worriers who hope it’s actually straightforward and doesn’t lead to death or some other unpleasantness. Actually, there’s also (c), those who are really (b) but who pretend they’re (a) for the sake of bravado or whatever. I’m a genuine (b) however, and while I didn’t lose any sleep over the Corridor Route bad step (compared with the In Pinn, which prompted a whole week of insomnia), I was mildly perturbed. As it turned out, there was no need for concern: the bad step proved to be “low in the grade” as the guidebook jargon has it – which is not to say that it’s completely trivial or to be treated lightly in adverse conditions (and there have indeed been accidents and incidents here). But overall, were a list of such obstacles to be compiled, it would come at the easier end (and it’s quite possibly the only one with direction arrows scratched on the rock). Needless to say, this in turn got me thinking about the more general question of bad steps: how many are there, what causes a place to acquire the name, and which is the hardest/easiest? There are quite a lot – even counting only those which always or sometimes go by the actual “bad step” name (and excluding differently named awkwardnesses such as the Witch’s Step on Arran and the Hunter's Pass on Beinn Fhada in Kintail). What follows, in this piece and a follow-up, doesn’t claim to be a complete or comprehensive list of bad steps – and if anyone knows of any omissions, obvious or obscure, please let me know – but it does attempt to cover a fair few while trying to analyse what causes the name to be applied to some obstacles and not to others. Taking the Lakes first, there is another bad step in the district, a much better-known one in that it pretty much always goes by that name whereas the Corridor Route version also gets referred to as “the awkward place”, the “bedrock step” and so on. The main Lakes bad step is on the southern approach to Crinkle Crags, coming from the Cold Pike direction, and is essentially a very high step up (or a very long stretch down) on the right wall of a chockstoned gully. Wainwright describes it in The Southern Fells, as “the most difficult obstacle met on any of the regular walkers’ paths in Lakeland”, which is a reasonable assessment although not, it should be noted, the same thing as the most difficult or potentially problematic route described in Wainwright’s seven guidebooks. The books include two tricky routes on Pavey Ark: Jack's Rake – which I once backed off and have never subsequently fancied – and Easy Gully, which I have been up and which has an awkward diagonal reachy move near the top – there was tat in a crack here on my visit in the autumn of 2005, indicating that some previous visitor had felt the need to tie on. I’ve more than once heard the theory that Easy Gully is the hardest thing in Wainwright, and this could well be right – it’s certainly a more serious place than the Crinkles bad step – but it’s not on a main walkers’ thoroughfare and this was a reasonable distinction made by AW. 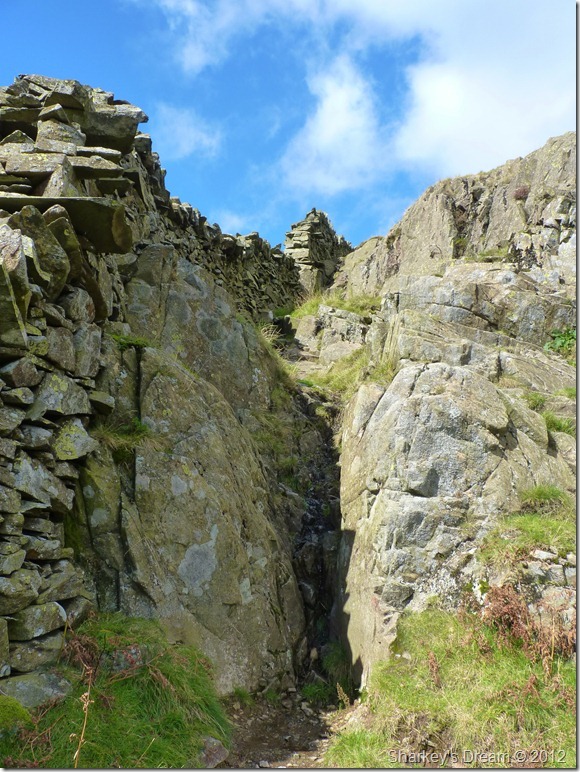 As for the Crinkles step, Wainwright describes it as the kind of thing that “everybody would get down in a flash if a £5 note was waiting to be picked up on the scree below”. That’s pushing it a bit, although the step is surely now harder – due to walkers’ polish – than when Wainwright was writing at the end of the 1950s, just as fivers are now more likely to blow away given that they’re made of animal fat and plastic. My own experience of the Crinkles obstacle is that whether it seems worth tackling (or whether it actually seems manageable) depends on a variety of factors including weather and mood – and I’ve heard other Lakes regulars taking a similar sometimes yes, sometimes no attitude to it. I’ve been down it without much fuss (no fiver was found), but once, on a dry summer’s day, on ascent and with every intention, I suddenly didn’t fancy it when I got there. It’s an odd place in that it’s not a genuine impasse: there are easy avoidances on either side. But it is something of a test-piece and the kind of middling-tricky obstacle that all regular Lakeland walkers should at least attempt at some stage. Unless I’ve forgotten something, I don’t think there are any other proper named-as-such bad steps in the Lakes – which means they’re outnumbered by another form of quirkily named obstacle, the Fat Man’s Agony, of which there are at least three: the well-known ones on Side Pike and on the approach to approach to Broad Stand, and an obscure one high on the Lanthwaite Green flank of Grasmoor. But it’s interesting to wonder why various of the other awkward places in the region aren’t labelled as bad steps. 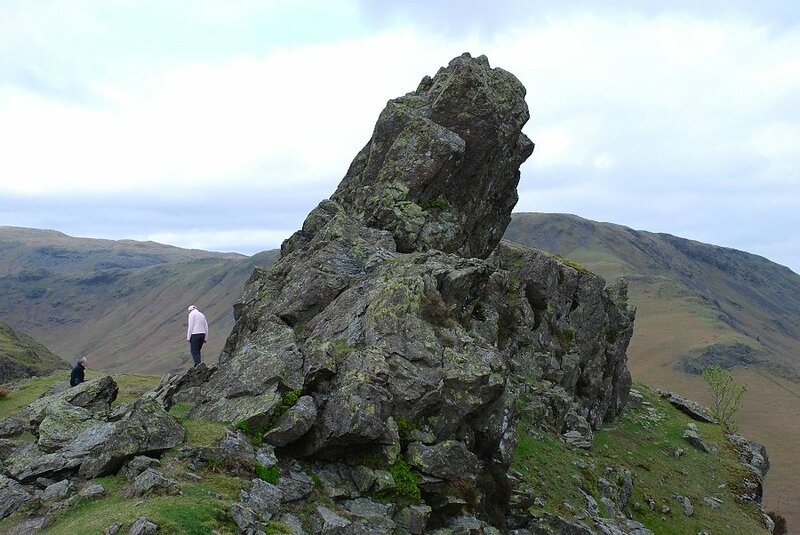 Some, such as the Howitzer on Helm Crag, are genuine scrambles, technically easy but exposed (and soap-like and alarming after 15 hours of continuous rain in my experience), while Broad Stand itself strays into actual climbing territory. 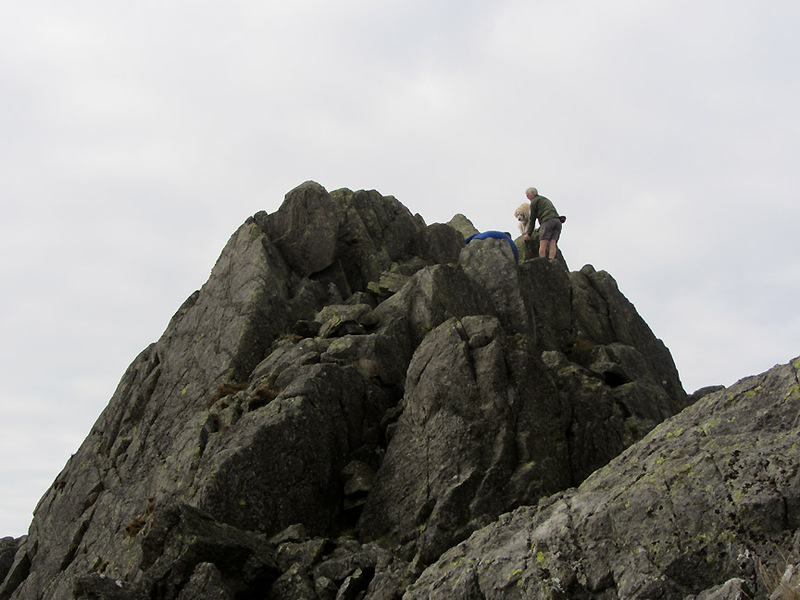 By contrast, the rocky summits of Pike o’ Stickle and the western Harter Fell have nothing specific enough to qualify as a bad step – they’re really just general clambering-about places (and anyway, a summit block perhaps can’t really be a bad step, the Clach Glas Imposter notwithstanding). Other places have a more valid claim to the name, for example the awkward step on the final bit of the northern approach to Glaramara; likewise the tricky section on the Stirrup Crag end of Yewbarrow, and even the little rock step beside the wall on Low Pike on the eastern arm of the Fairfield horseshoe. But I’ve never heard any of these called an actual bad step, and I was going to say the same of the much-frequented chimney near the western end of Striding Edge on Helvellyn – but then, while researching this piece, I came across a few references to it by that name, even though in my experience it tends to be called “the awkward chimney” or “the tricky place” rather than acquiring full-blown BS status. It does fit the format, however, in being clearly the most problematic spot on a generally easy route – and plenty of accidents have happened here over the years. 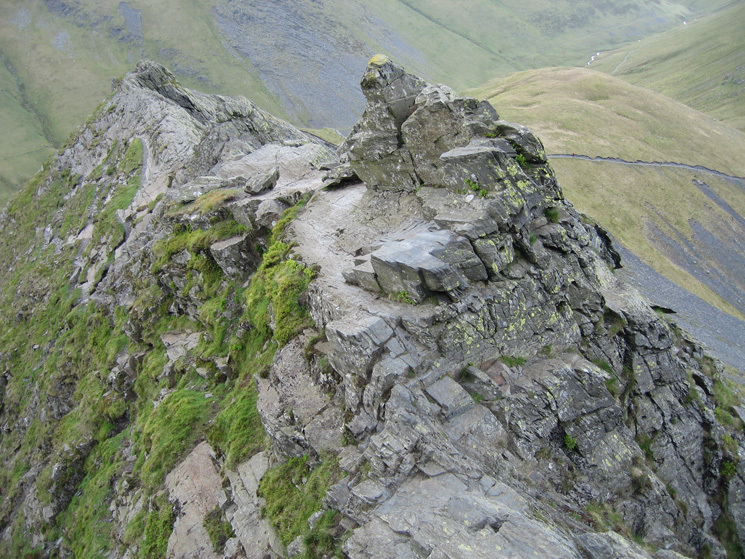 Then there is Sharp Edge on Blencathra, generally reckoned to be half a grade more serious than Striding Edge, largely because the slate is smoother and less juggy. 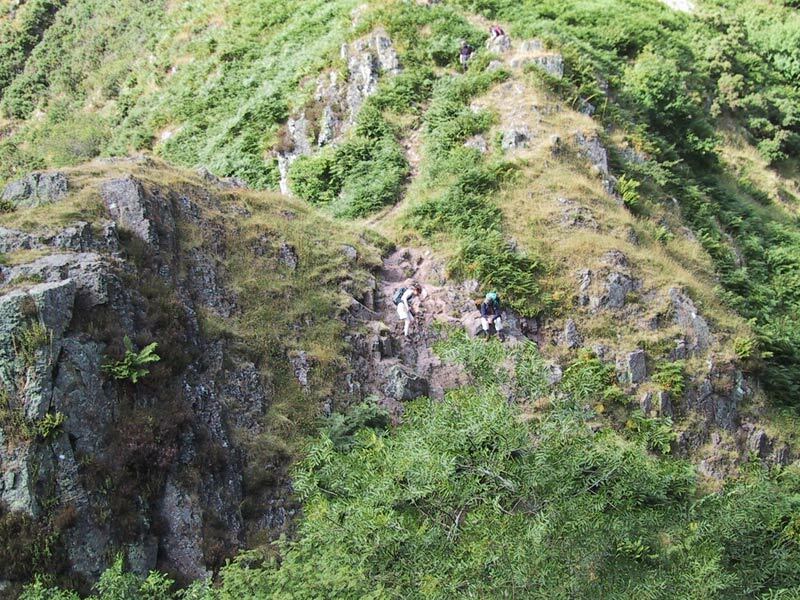 The little neck where Sharp Edge pinches down below the steeper slope of Foule Crag is a definite candidate for bad step status, and has been the scene of a remarkable number of often serious accidents, usually due to people trying to outflank it rather than staying on the ridge. But while the main retrieval site has acquired a name of its own, “the usual gully”, courtesy of diligent if weary rescue team members who abandon domestic arrangements for the umpteenth time to help yet another hapless fellwalker, again I don’t think I’ve ever heard the neck itself called a bad step. Overall, while every location is different and there are no firm rules, bad step status seems to lie somewhere between the old-fashioned and rather ageist label “granny-stopper” and the hard scrambling / rock climbing term “crux”. Granny-stoppers tend to be trivial obstacles that are less serious than they look, coming early on in an outing and daunting some walkers sufficiently to cause them to retreat or find another way. A classic example of a granny-stopper can be found on my own patch of the Ochils, in the form of the outcrop at the foot of the Law, where the Mill Glen path crosses the burn. The outcrop is just a few metres high and easy both up and down in dry summer conditions, but it does need care and it’s common to see people using the “five points of contact” method in descent. Coming as it does at the start of the ascent, it serves a useful purpose given that if anyone – not just a woman of pensionable age – feels deterred here then they probably shouldn’t be going any further. The Law outcrop definitely isn’t a bad step – I’ve never heard it called that – and in the follow-up piece I’ll discuss a couple of places at the other end of the scale, where bad step-type problems are too tricky and serious to merit the name and thus become cruxes. So much for the Lakes and for England, anyway – at least I can’t think of any bad steps in my old haunts of the Peak District, or in the Yorkshire Dales or the far south-west. And I’d be surprised if there are any on Box Hill or Hampstead Heath. 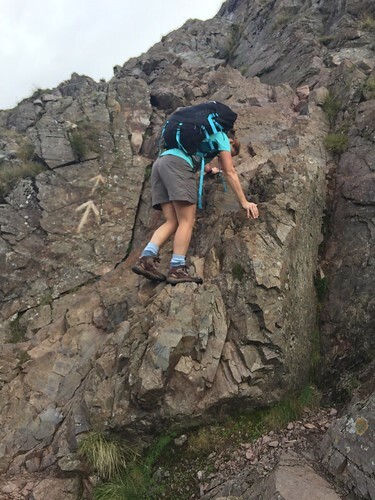 There is at least one quite substantial bad step in Wales – on Crib Goch – but my knowledge of those parts is so thin (back to those CV gaps again) that I can’t offer any useful opinion on it. Scotland, by contrast, has plenty of the things – including three on Skye – and some thoughts on these will follow in due course.